If you’ve never considered the addition of a tree inside your home, you are in for a pleasant surprise because they are both affordable and absolutely gorgeous inside any home. For many people, nature presents a relaxing atmosphere, free from the crowded and noisy hustle of city life. 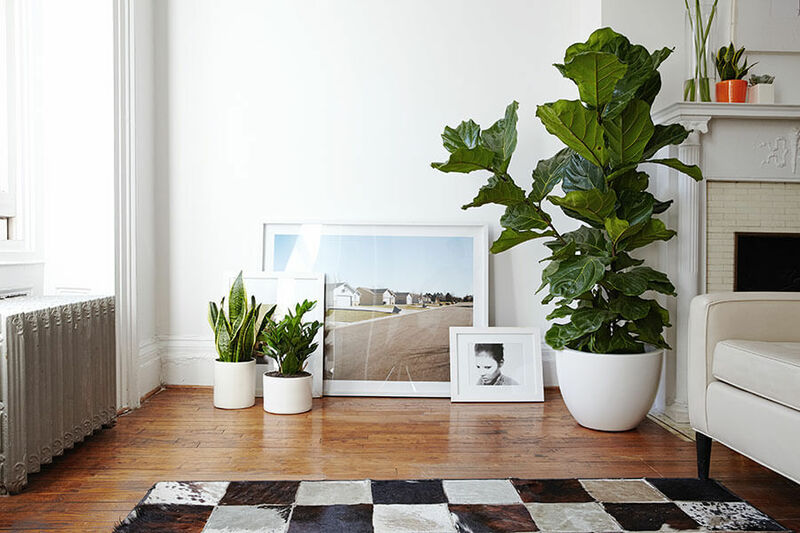 So, add trees to your home for an easy way to create a calm atmosphere in your home. There are great advantages to including the placement of trees in the interior design of your home. First, they have a calming effect that contributes to a stress-free environment. Next, there are several varieties from which to choose and your interior designer will happily design trees into any type of décor. Also, trees are quite affordable to maintain when you provide them with the right soil, plenty of water, and lots of sunlight. If you decide to plant fruit-bearing trees, then you get both a beautiful atmosphere and fresh produce as well. Some examples are broadleaf fig trees (shown above), citrus trees, olive trees, peaches, and apricots, which do well indoors with the right care. But let’s also remember the fresh air in your home that is produced naturally by your house trees. That in itself is an invaluable added bonus. Now that you know how incredible they are, let’s see how you might incorporate them into your space and make the most out of what they offer. The selection of a decorative pot along with the beauty of the tree will add to your interior design nicely. As for the tree, you can select from many designs. 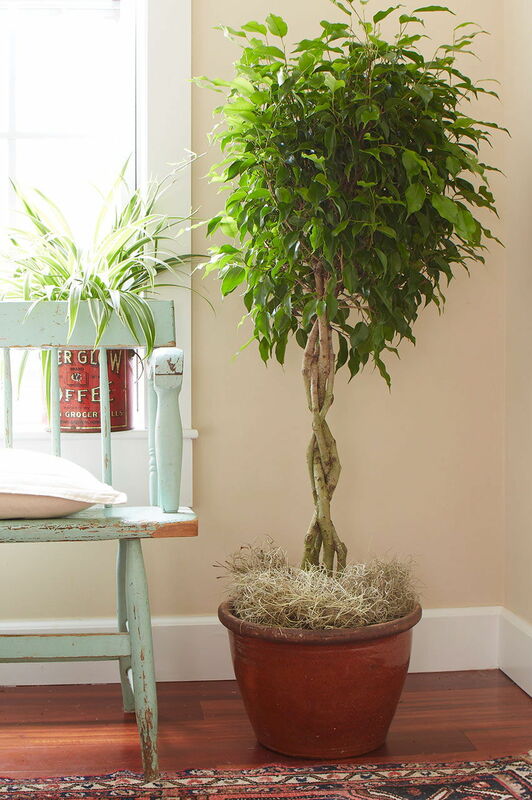 You might start with something full and easy to maintain like the Ficus tree as shown directly below. Or you might try something brilliantly subtle like the Red Maple Bonsai Tree, which is a compact yet exquisite way to introduce trees into your home. Another idea is to construct around the tree, which brings in an exciting element because the tree takes its natural course, thereby creating effortless beauty. Trees are artistic and unique in their most natural form. However, to ensure against potential hazards trees might cause to your home, we recommend that you seek professional advice, which you can readily get at Tree Quote. To get the most out of them, you need to care for the trees or plants. Keep in mind your chosen tree that requires its own particular maintenance. Here are a few things you need to know to keep your trees healthy and thriving. The type and intensity of light required. The type of soil mixture required. The type of fertilizer your tree needs. 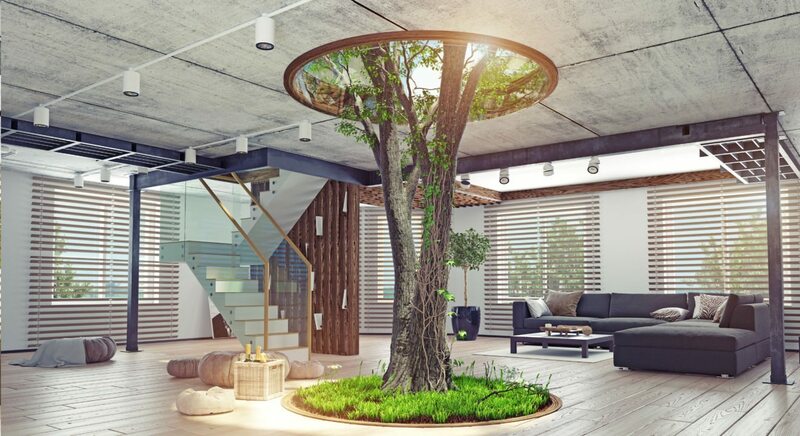 Do you like the idea of bringing nature into your home? If the answer is yes, then we recommend that you add trees to your interior. Not only do they offer many design alternatives, but they are also both aesthetically pleasing and functional. We wish you the best of success as you begin to add trees to the interior design of your home.